The narrow sandy tracks often have small humps which are difficult to detect and which can energise to put the vehicle into a series of ever increasing bounces. They also have high ‘middelmannetjies’ and it is dangerous to get off the road for oncoming vehicles, because of the dry grass. We passed three burnt-out vehicles that caught fire, almost certainly from stopping over the dry grass. During and after the rainy season some stretches around the pans would be quite muddy; now they were deep, hard mud tracks. Each campsite has a bucket shower (for which you have to provide the water), a long drop toilet and a fire place but no other facilities. You also have to dispose of your own garbage; best being to burn what you can in your campfire and carry tins and bottles out. The Kalahari is one of those photogenic places where the light is supernaturally beautiful. The golden yellow grass of the dry season shades in nicely with the grey sandy tracks and contrasts with the soft blue-grey sky. 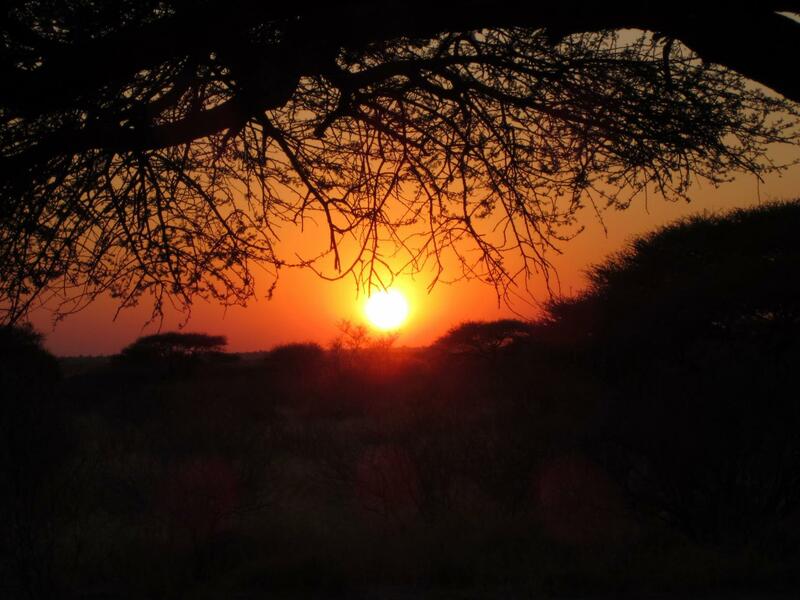 Red sunsets takes your breath away while the soft colours of the sunrises and the bright starry night sky, together with its remoteness, makes a visit to the Kalahari a soul cleansing experience. The birdlife is prolific. 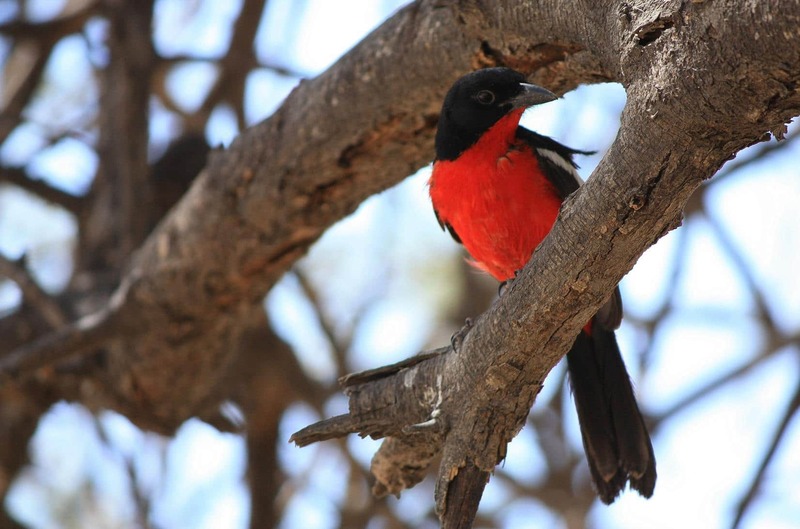 Rare bird species that you will see plenty of in the Kalahari include the small but bright Crimson-breasted shrike, Korhaan and Kori Bustard. 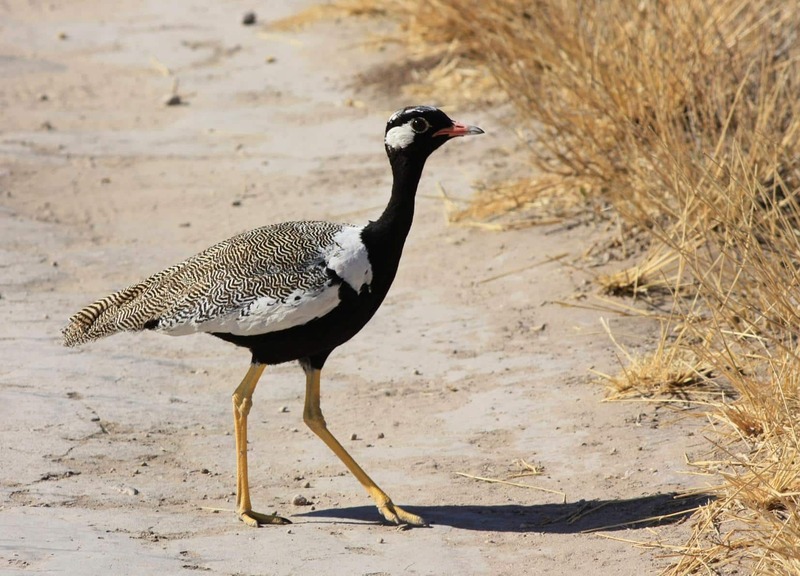 It is also nice to see wild ostrich roaming the pans and small animals like ground squirrels ‘scoffling’ in the sand. I have never seen as many silverback jackal and bat-eared foxes in any other park. 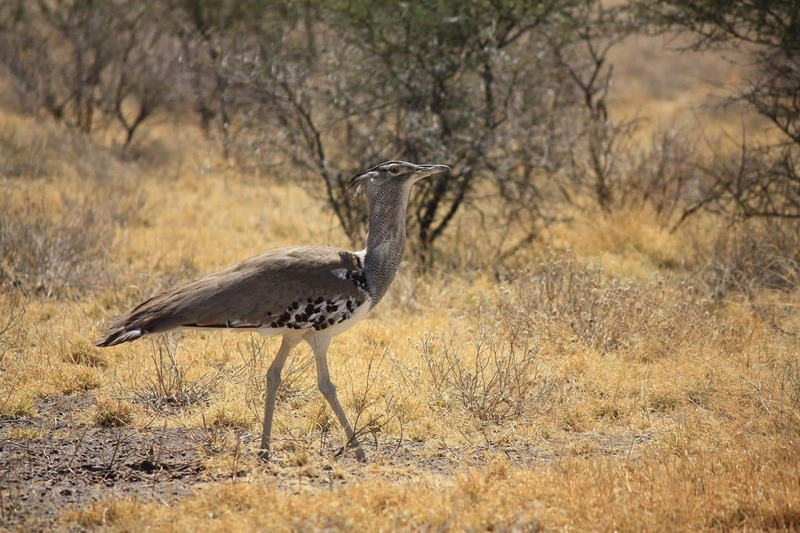 There are an amazing number of Kori Bustards in the Kalahari. 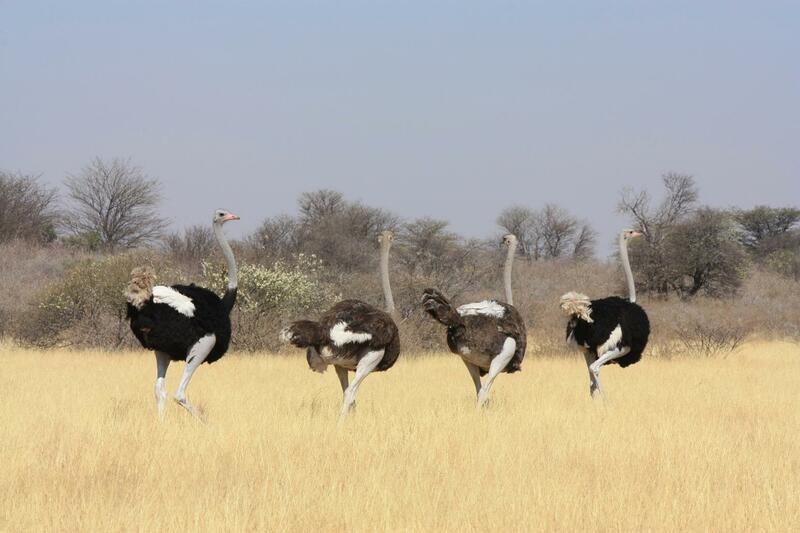 Wild ostrich roaming the Kalahari. From Francistown we followed the deep sandy track to Matswere gate. Normally there is drinking water available here, but now the borehole had run dry. Fortunately we had two full 70 litre water tanks on board, but, on doing the arithmetic, we realised that stretched over 5 days and 4 people, this meant an allowance of only 7 litres per person per day. 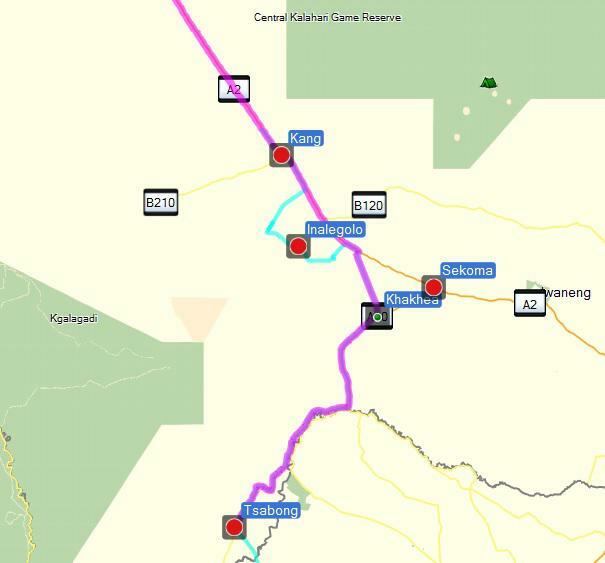 Our plan was to traverse the whole Central Kalahari Game Reserve, from the north-east down towards the west of the park, then back towards the centre, there turning south to exit at the adjacent Khutse Game Reserve. However, we were warned by the park officials at the Matswere Gate that this was an ambitious venture. 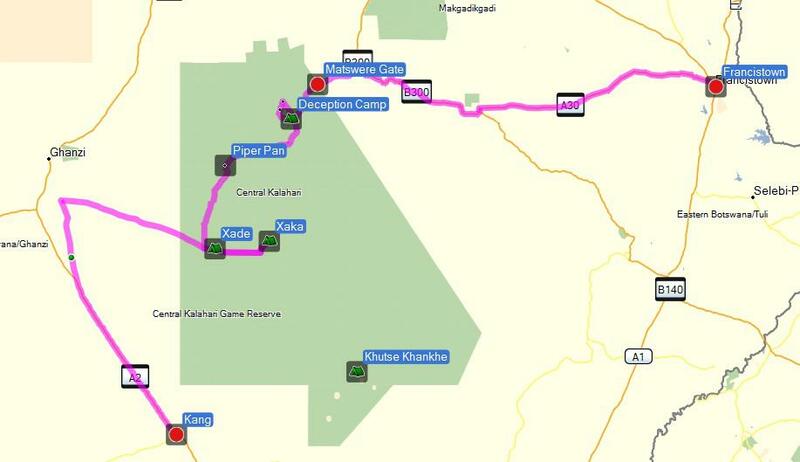 They were surprised that we planned this route and advised us that the 233km drive from Deception Camp to Xaka Camp would be too long to do in one day. He kindly made some phone calls and changed our booking to Xade Camp, which turned out to be excellent advice. We spent the first night at Deception Camp and did a loop to Sunday Pan and Leopard Pan the next day, spending the second night also at Deception. On this loop we stopped to lend a hand to two German women who had a flat tyre. As it was late in the afternoon they were very relieved to get assistance. Assisting two German ladies with their flat tyre. 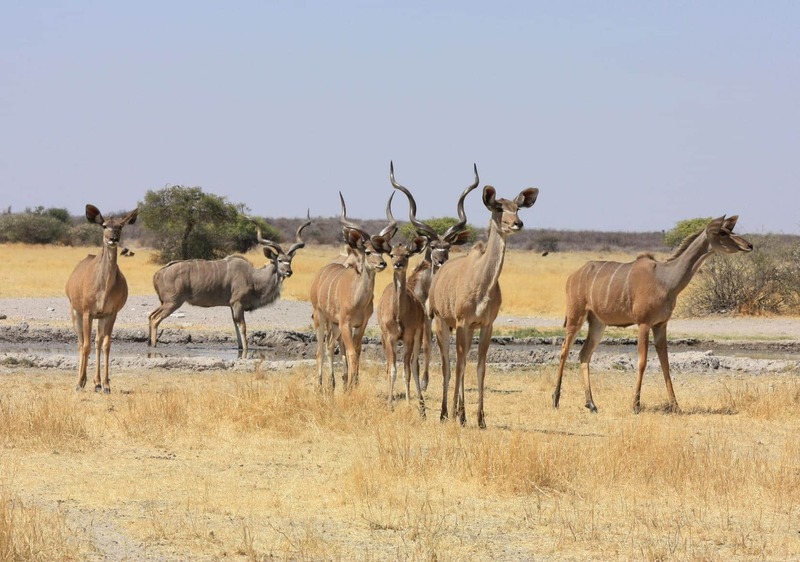 In early September the Kalahari was dry and the only water available to the animals was at the manmade waterholes fed by solar powered boreholes. 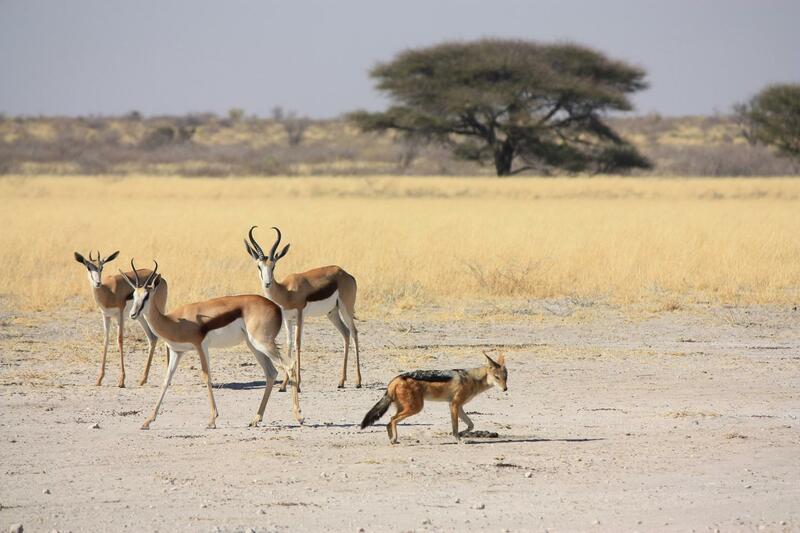 Such was the one at Sunday Pan where oryx, springbok and jackal congregated and we spent hours enjoying the wildlife. 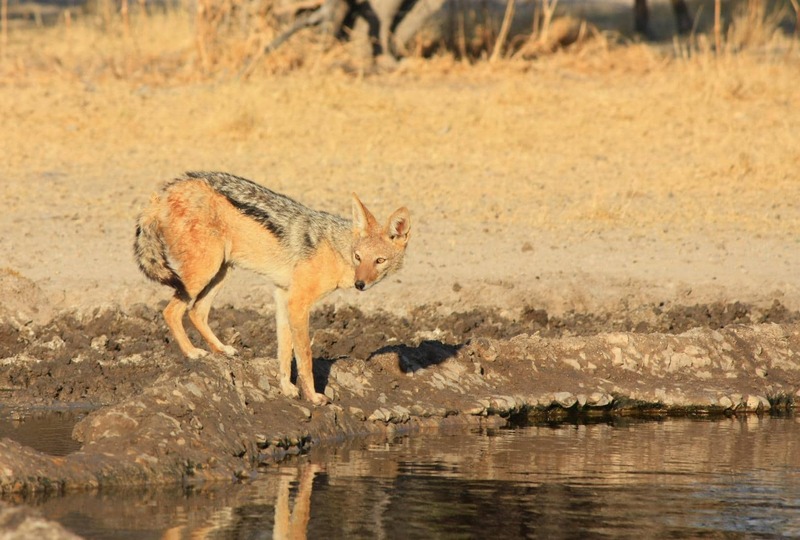 A jackal coming to drink at Sunday Pan waterhole. An oryx coming to drink. On seeing springbok digging for bulbs to eat, one gets new respect for the bushmen who used similar tactics to survive in the Kalahari. The whole southern Africa region was suffering from drought and during our visit before the rainy season, the pans were bone dry. 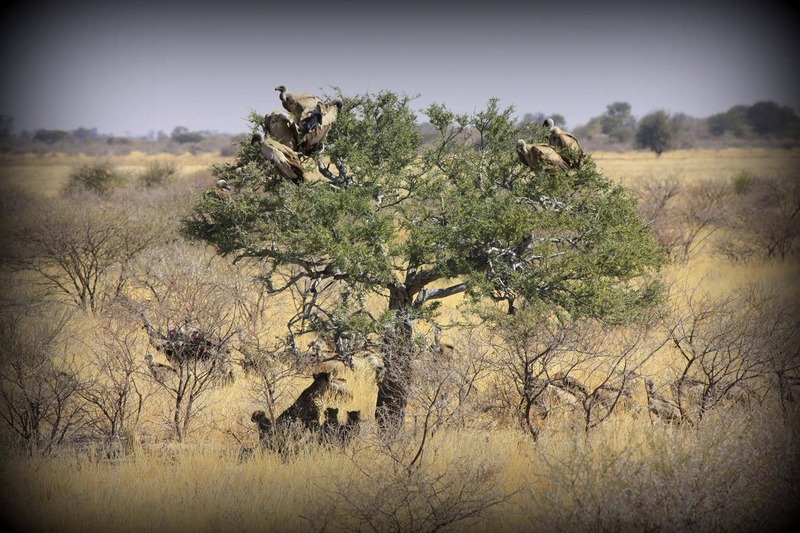 However, the striking copses of green trees on the open yellow grassed pans showed the presence of underground moisture and made it easy to spot the animals. One such sighting was a cheetah with her three cubs close to Leopard pan. When this family had finished their feast, vultures moved in until three jackals chased them away. Once the jackals had had their meal, the vultures returned and were joined by some crows to squabble over the scraps. Spot the cheetah and her three cubs! The next day we passed Piper Pan en route to Xade. This massive pan was also bone dry, but still had plenty of game roaming the short grass. 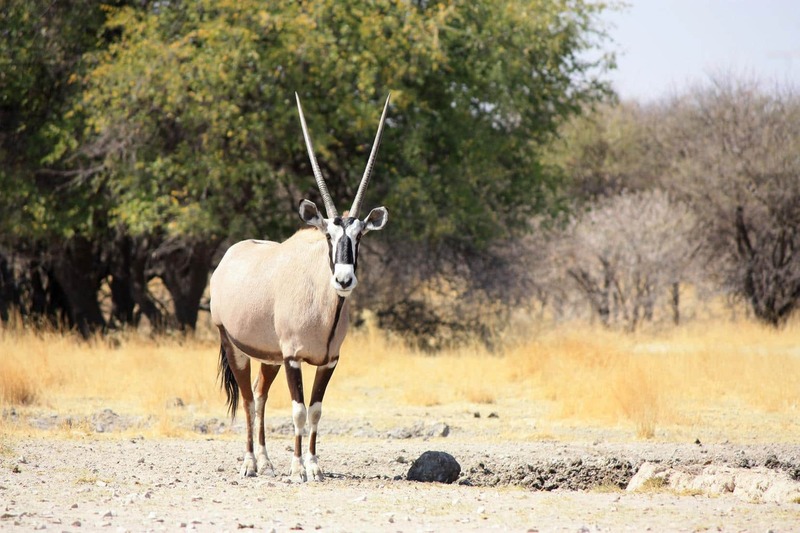 Many animals congregated at the Piper Pan waterhole and, for the first time in this park, we saw Kudu, exquisite with their regal horns. 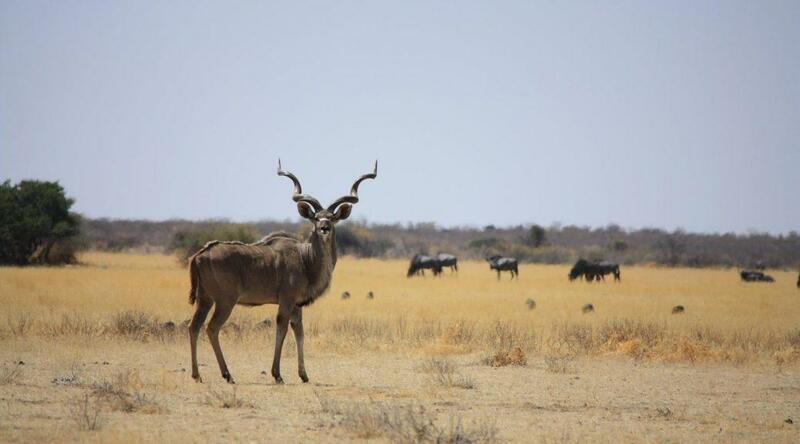 Kudu at the Piper Pan waterhole. It turned out to be a lengthy day with long stretches of deep sand. We did not expect to get water at Xade Camp near the west of the park and were thus pleasantly surprised when we found drinking water and ablutions with showers and flush toilets at the entrance gate. As we had already prepared ourselves for another bush shower, we didn’t mind the fact that the shower water was cold as elephants had damaged the pipes of the solar heating system. The elephants had also damaged the water pipes leading to the nearby waterhole which was almost dry when we got there. However, having wondered at the absence of these giants thus far, we managed to get a brief elephant sighting near the hole. From Xade to Xaka the going was extremely rough! Deep, rutted and bumpy sand meant first and second gear driving; just about the worst we have encountered on any of our African trips and we wondered how any broken down vehicle would be pulled out! About halfway to Xade we stopped to pump our air suspension but made an alarming discovery. It appeared that our water tanks were leaking! We did not know how much had leaked and if just one or both water tanks were affected. 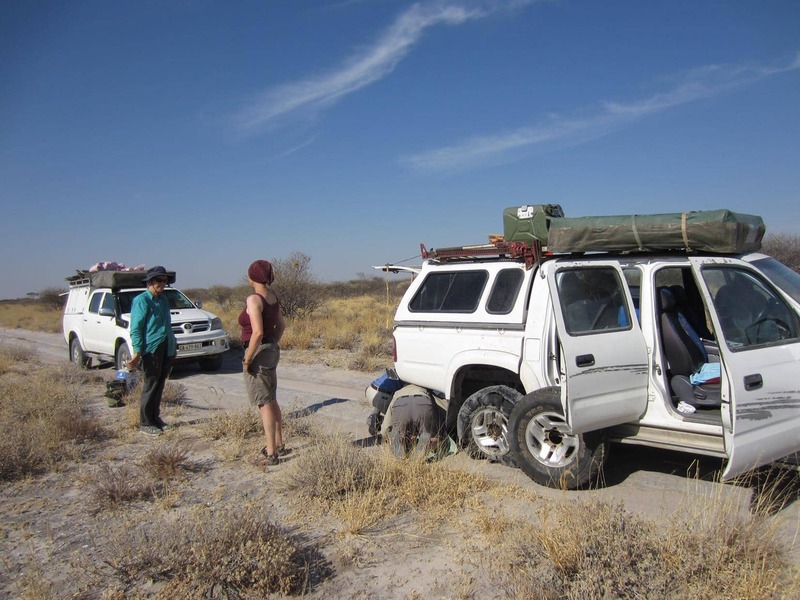 With four of us in the vehicle, and knowing that there was no water on the very long and very slow journey to Xaka and then to Khutse, we felt we had no choice but to return to Xade. There we topped up both tanks to see how much water we had lost and realised with relief that one of the filler pipes had fallen down and it was just the overflow from that that had caused the leak. However, by this time it was after midday and we realised that we would not make Xaka before night fall, having gained new respect for the distances involved in those very difficult driving conditions. Quite disappointed we overnighted at Xade again and, since our advance booking for Khutse had gone awry and there was no game to be seen on that route, we changed our route plan to exit at Xade and travel to McCarthy’s Rest border post via Kang and Tsabong. After the difficult sandy driving we enjoyed being on the excellent Trans-Kalahari highway. However, this pleasure was short-lived as we had inadvertently left the GPS on shortest distance which prematurely routed us onto more deep sand on the cutline towards Mabuasehube. We thought this was our intended shortcut south on a gravel road before Sekoma, only realising our mistake too late! Fortunately we met some locals who showed us a sandy shortcut east to Inegalago which was not yet on the T4A map and after about 3 hours of this unproductive detour we got back on track. 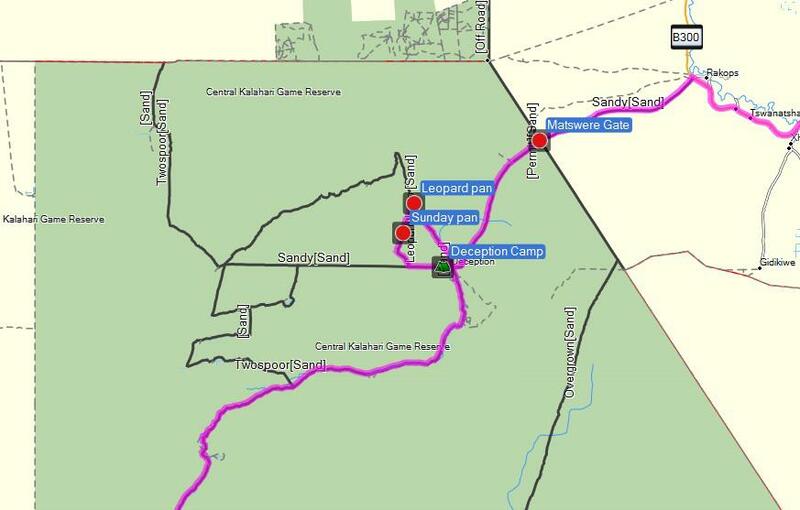 Our intended route from Kang to Tsabong is marked in magenta and our detour is shown in blue. McCarthy’s Rest turned out to be the nicest border post that we have yet encountered. It is small and very neat and the officials were friendly, displaying a sense of wry political humour following our inquiry as to what had changed in South Africa since our departure! It was good to be back and rounded off a pleasant visit to Botswana. 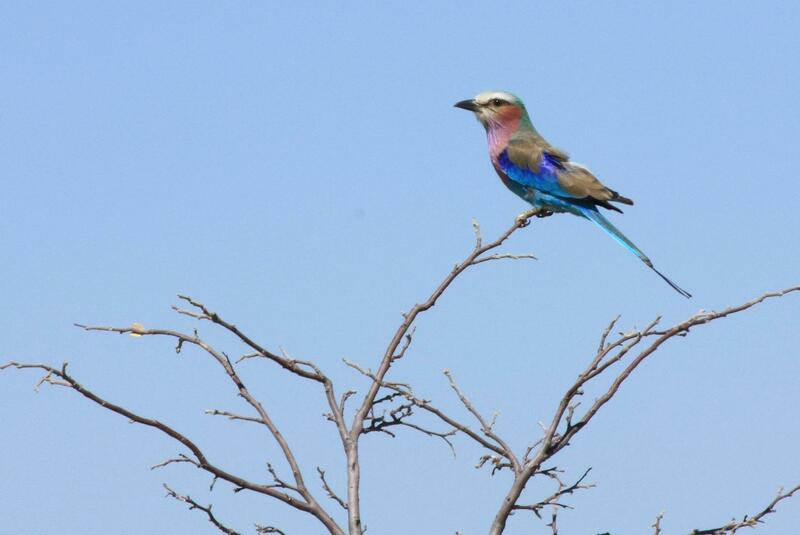 You can book camping at Matswere gate, Deception Pan, Sunday Pan, Leopard Pan, Xade Camp and Xaka Camp by contacting the Botswana Department of Wildlife and National Parks (DWNP) at dwnp@gov.bw. You can book Khutse GR by contacting Big Foot Tours at reservations@bigfoottours.co.bw. Previous PostIs now a good time to travel Zimbabwe?Next PostCelebrating 10 years of GPS mapping! Paula, There is no risk of vehicle burnout in the campsites. Normally seeds and grass getting stuck on the exhaust while you drive is the biggest risk. However, even if you didn’t get any seeds or grass stuck, the heat from your exhaust (especially after you have driven for some time) can also ignite long grass when you stop over it. 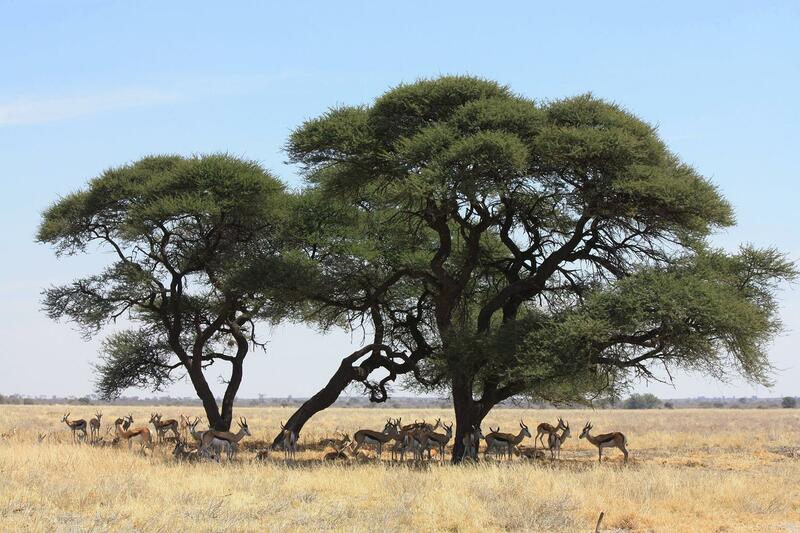 The Kalahari should be less dry in April than in August when we were there…. Karin – Thanks for your feedback. I am not sure which cut-line you took out from Xade Gate. Was it the N/S cut-line that runs down the western edge of the CKGR? If so you could have kept going as the thick sand only goes for about 20km to the settlement near the Okwa river. After this it is firm and you can do 60kph or more in 4H. We followed a similar routing to you in Jan 2015. see the report on the 4×4 Forum. We were advised by the parks officials not to take the cutline that runs N/S down the western edge of the park for 120km. Thanks for informing us on the road condition; it seems like we could have taken it! I hope you have donated your trip tracks to T4A? Karin – I am not that sophisticated with my Garmin on storing tracks. The tracks we used were generally well mapped on T4A. However, if you read my trip report, we did do an unmarked route in the CKGR from Tao Pan to Letiahau valley. I do think this is an important addition to CKGR tracks. Some waypoints and general routing are in my report. This is a T4A blog. Only just realised. We of course we’re using T4A maps. What I wanted to say, and it’s a real problem with modern GPS units, they don’t work with tracks properly, meaning you can plan your intended path, load it up and as soon as you go off route to spot some game, it reroutes you and you end up with unintended journeys. You can end up in real trouble. If you are going to use a modern cheapie then you must have a garmin legend or other cheap unit that works on track only so you can stay on route. I use an old 276c. It has never let me down and wouldn’t sell it for no amount of money. BUT I carry maps and compass to. The interior of Botswana is flat and should the worst happen, how long would your GPS battery last on a 5 day hike? Rightly so. Never venture into the wild with only gps. A map! A compass! Great article and I hope your next trip works out better. One of the burnt out vehicles (slap in the center of the park) is from our first attempt to cross in 2010. My mates jeep went up in smoke, factory fault, not grass, but we didn’t know this at the time and made the trip out nerve wracking. One vehicle and 4 grown men we had to abort. The CK is wild. Your planning and discipline needs to be of the highest. We all returned earlier this year to make another go of it, sadly the driver of the Jeep passed away 2 years ago. We did the trip in memory of him and the adventures we have done. We made it all the way from the top and out through Khutze. Sadly this trip was not without its disaster either, we had to evacuate one member who was almost dying from internal bleeding from a burst stomach ulcer. He wouldn’t have made it to the other side of the park. Tins explode in the ammo boxes from the rough road, and the seriousness of where you are (and how long it will take to get out) soon sets in. We had black maned lion around our camp at night and in the morning the male ventured right into the middle of our tents. Can I compare CKGR with Mabuasehube / Nossob Trail with respect to driving conditions?? Paul, unfortunately we did not see any lion this time. But the Kalahari is magical! Did you see many lion?